green. marine. conservation. florida. wildlife. SCUBA. research. and sometimes cupcakes. Something About Cats and Tuna ..
Make Way for the Crabs! The Tour de Turtles is back in force this year and Sea Turtle Conservancy’s 17 satellite-tagged competitors are out churning through surf and making some bubble tracks! The official race starts tomorrow! But this year it’s not solely about who wins or loses. 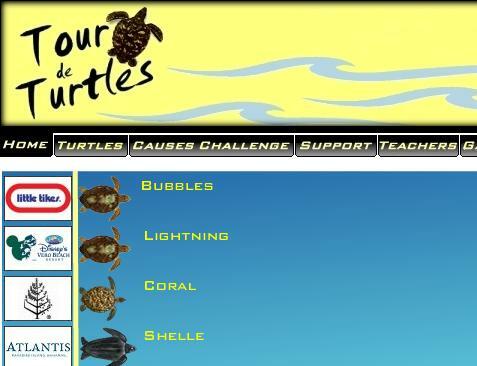 Each of the competing turtles has a cause they’re swimming for as well as corporate and nonprofit sponsorship! My favorite – Lightning McQueen – has Disney backing her! And her cause? Light pollution and its effects on natal nesting beaches for future turtle generations. The website is fantastic, fast, and regularly updated, so be sure to check in, find a favorite racer, and follow along. 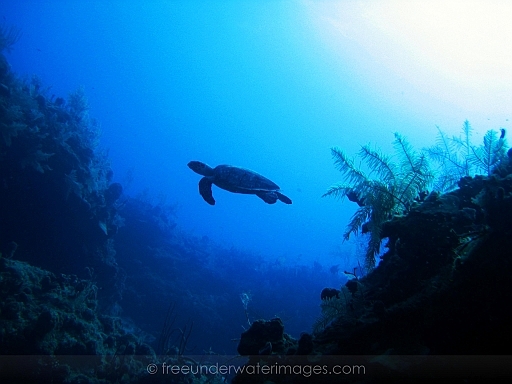 You can of course “like” Sea Turtle Conservancy on Facebook and get regular updates through social media as well. Enjoy! And GO LIGHTNING MCQUEEN! Posted in education, fun with fins | Comments Off on Lightning McQueen to Win! Marmoset for Sale? Better Have A Permit! Remember the other week when FWC officers busted a guy on out-of-season hunting violations based on his Facebook photos? Well, the FWC doesn’t stop there in using the internet to search out wildlife violations in Florida. 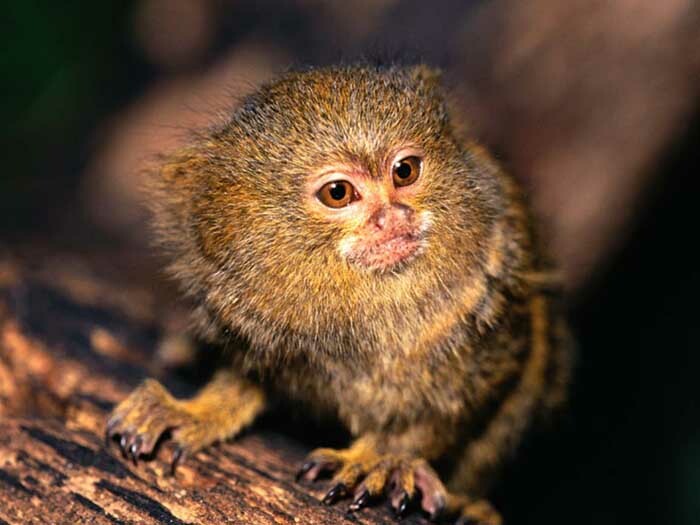 Recently officers were tipped that a man was attempting to sell a marmoset – a small monkey requiring a special permit for sale and possession in our Sunshine state – via internet classifieds. They set up a sale with him over the web to purchase the animal at $2,700. When the man opened up his home for the investigators to view the monkey for purchase, they smacked him with several misdemeanors after he failed to produce the necessary permit, including a violation that the size of the cage for the monkey was not in keeping with standards. Posted in conservation | Comments Off on Marmoset for Sale? Better Have A Permit! A Panama City man was knocked off his bicycle July 7 on Highway 98 in Tyndall AFB when a black bear trying to cross the busy four-lane highway collided with him. 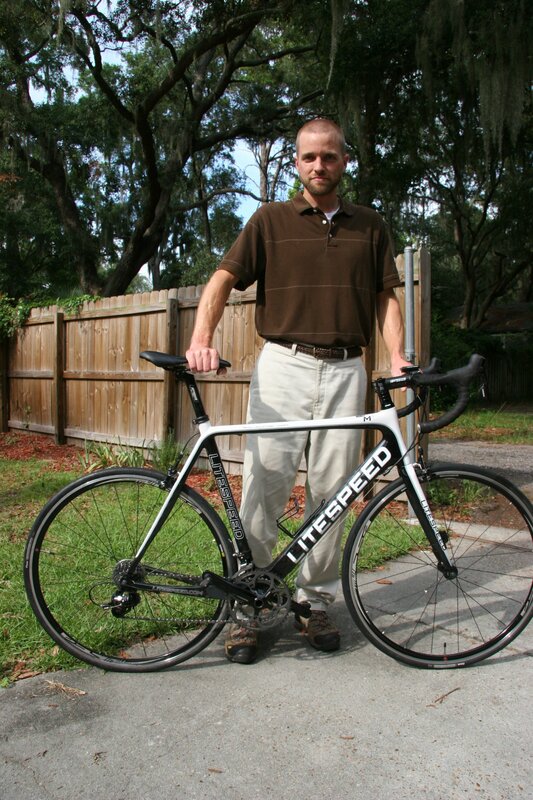 John Hearn, who works on Tyndall and bikes the 12 miles to work several times a week, was left with bumps, bruises, road rash and a broken bike after the collision at 6:40 a.m. The bear, estimated to weigh 250-300 pounds, bolted into nearby woods after the collision. Hearn estimated he was going 23 miles per hour when the unexpected happened. He did not require medical attention. In the four years he’s been biking to work Hearn says he’s been hit by cars twice but this is his first encounter with a bear. 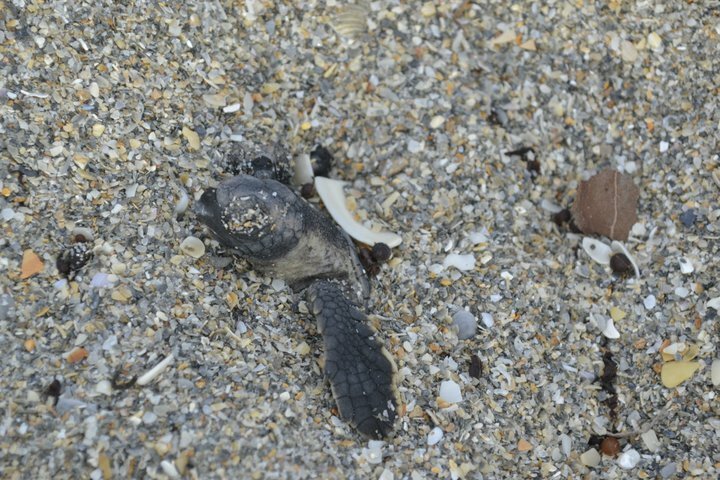 It’s hard to believe but groups around Florida are starting to report hatchling sea turtles on their beaches! The Florida Oceanographic Society shared these awesome photos of tiny loggerheads coming up out of the sand and makin’ tracks down to the water at Bathtub Beach. As always, if you’re lucky enough to see an emergence of sea turtles in person, do not get this close (these photos were taken by permitted individuals) and let them do their own thing. It may seem helpful to walk them down to the water, but that natural weeding out that occurs is a necessary thing. Something that you can do to benefit the hatchlings? Always be sure to fill in the holes from your sand castle building adventures! (Also tear down any castles before you leave.) These monuments and pitfalls can become traps and are potentially lethal to hatchlings that are scurrying off the sand in favor the water away from gulls, racoons, and crabs. 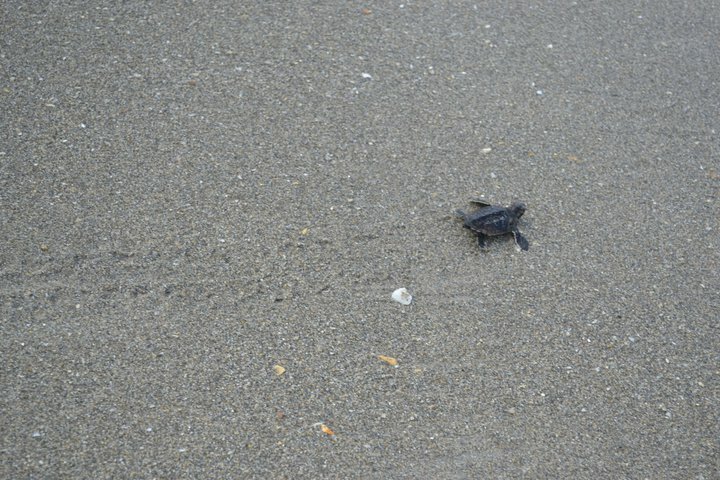 Stranded and sick hatchlings (or “washbacks” as they’re termed if they occur after strong storms) can always be reported, the best group I know of for our area is the Sea Turtle Preservation Society. Posted in conservation | Comments Off on They're Heeeeere! How fun is this?! New Smyrna Beach is a lightning rod for shark activity. It’s well known locally and internationally by the dubious distinction as the “shark bite capital of the world”! This fact hardly deters all the surfers here in the Sunshine State. Many I know have a deep reverence for these animals and see their presence in the water as good luck in some ways. However, that’s typically when they’re sighting smaller blacktip sharks. Who knew we would ever see video of a spinner shark (Carcharhinus brevipinna) beautifully executing the feeding strategy that earned him his moniker in video! All new meaning to hang ten if you ask me. Turtle Release! And You Can Help! Calling all central-Florida-sea-turtle-lovers! The Sea Turtle Preservation Society just announced an upcoming release of 32 juvenile loggerhead turtles into the Indian River Lagoon on Monday, June 27th. Do you want to view the action and/or participate? You can! The juvenile turtles were previously part of the National Marine Fisheries Service TED (turtle excluder device) certification trials and are now ready to head back to the wild. NMFS’ Ben Higgins is hosting the release. Head on down to Melbourne and pickup coastal highway A1A. Drive south, passing a great deal of very charming mailboxes with awesome island themes, until you come all the way down to Sebastian Inlet State Park. Continue about one mile further south of the inlet and find a spot on the Lagoon side (not the ocean side!) to park. This is the site of the release. June 27th, Monday, bright and early! The release is schedule for 8a.m. and NMFS is asking that volunteers arrive no later than 7:45a.m. And yes, this is rain or shine! Yes! If you’re interested in assisting you MUST bring water shoes that are closed toe and clothing for getting wet. You’ll be waist-deep in the IRL’s waters for the actual release. I’d say sunscreen, hats, water, and towels are also good bets. It’s a long drive down to the inlet on A1A with few pitstops for food and water, although the early morning time will make the release much more enjoyable. Bring your mosquito repellant too! I’m not sure if I’ll be able to make this event personally but if you do go take some photos! You could be a guest blogger on WaterNotes! Posted in conservation | Comments Off on Turtle Release! And You Can Help! No Rear Flippers, No Problem! The wonderful people at the Loggerhead Marinelife Center posted this video over the weekend of a female leatherback sea turtle, nicknamed “Clover”, nesting near Juno Beach. Clover is a known turtle – and easily sighted – because she’s missing both of her rear flippers! You’ll see little stumps in the video but trust me, her actual flippers would be much larger. Clover was first sighted by LMC in 2003 with only a portion of a flipper missing. By 2005 both rear flippers were effected and in 2007 she showed up with no rear flippers! Judging by the marks and scars across the stumps, and even her front flippers, the LMC crew thinks she’s been tangling with sharks and so far living to tell the tale. The fact that this female has been able to survive such injuries on her own in the open ocean is really quite the testament to the strength of leatherback immune systems. I mean.. do you know how many bacteria and viruses swarm in the average drop of salt water? It’s not like these guys can swim off to the nearest pharmacy for some Betadine and Neosporin! If you know much about sea turtles, you know that they make use of those enormous paddle-like flippers to dig out their nest sites in the sand. It’s crucial that the nests are deep enough to protect the eggs and also generate proper incubation temperatures. So how do you dig out all that sand if you don’t have rear flippers?! Easy, you get the LMC’s biologist crew to help you. Each time they spot Clover they creep up behind her and help her dig out the nest so that she doesnt crush her eggs. So far this season, Clover has nested SIX times! That’s a lot of ninja-like biologist skills needed to help her little ones have a chance at life. Thank you to the LMC staff for your hard work! You can check them out on their website, and keep in mind they run tours and camps throughout the summer that are not only fascinating and fun, but also help support this nonprofits’ efforts on behalf of wildlife. Posted in conservation | Comments Off on No Rear Flippers, No Problem!